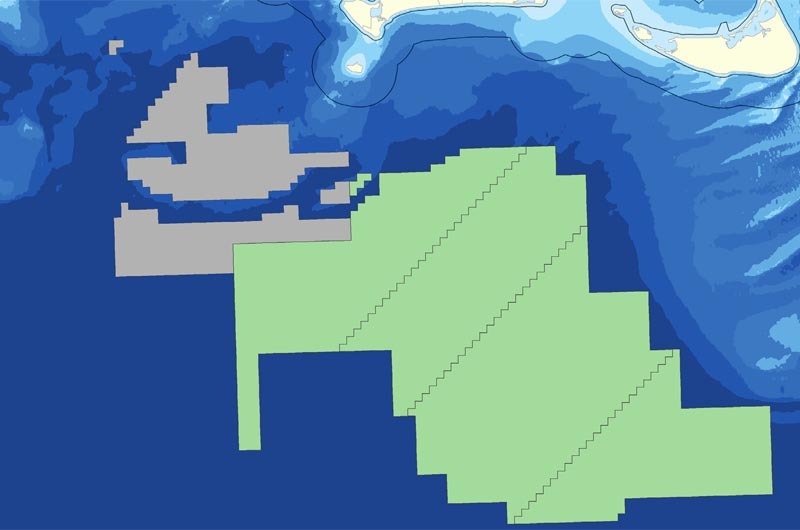 A 1,200-square-mile wind energy area 12 nautical miles from shore goes to auction on Jan. 29. Vineyard Power, the Island-owned energy cooperative, is preparing to partner with a private developer in bidding for leases early next year in the federally owned wind energy area south of the Vineyard. The 1,200-square-mile Massachusetts wind energy area begins 12 nautical miles from shore and is divided diagonally into four zones. Developers will bid on 25-year leases on one or more of the zones at a federal auction Jan. 29. Vineyard Power’s partner, not yet chosen, will bid according to the preference of Vineyard Power members. Over the past five years, a task force representing all six Island towns, the Martha’s Vineyard Commission, the Wampanoag Tribe of Gay Head (Aquinnah) and the Dukes County Commission, has worked with the federal Bureau of Ocean Energy Management to refine the size and location of the wind energy leasing area. As a result of that work, the area was reduced by half and moved from nine to 12 miles from shore. Vineyard Power played a role in those efforts, and has also advocated for the leases to benefit the Island community through local infrastructure, job creation and other means. The BOEM has agreed to recognize a community benefits agreement and to provide a discount to developers who partner with a community organization such as Vineyard Power. The discount was recently raised from five to 10 per cent, in response to efforts by Vineyard Power, state representatives and senators, and local selectmen. “Without that discount in the auction, it would be very hard to attract a developer to want to do anything with us,” Vineyard Power president Richard Andre told the Gazette this week. The discount would apply to any winning bid made by the partnering developer, and the developer would in turn commit to a community benefits agreement. Each of the four zones is divided into blocks of nine square miles. Mr. Andre believed most developers would want to obtain multiple zones, since the shallowest waters extend across all four zones. He said bids might range anywhere from $4 million to $15 million. Cooperative members have indicated a preference for the two zones closest to the Vineyard, since that would lower development costs and eventually lead to lower energy prices for customers. But members must still give their final approval before bids are made. Mr. Andre said that there would be outreach efforts and perhaps a public meeting for members prior to the auction. The size and location of the wind energy area reflect local concerns regarding commercial and recreational fisheries, mammal and sea duck habitat, boating areas and the views from shore. Mr. Andre said a wind farm 12 miles from shore would be visible “on very, very clear days, but it would be very small and not really intrusive.” He added that the most ecologically sensitive areas were within 12 miles. Warren Doty, a Chilmark selectman and task force member, said the BOEM had taken local concerns seriously in moving the area 12 miles from shore. “We thought it was a good thing that they made it at least that far away,” he said. But he said there still are likely commercial sea scallopers and lobstermen from New Bedford who utilize the wind energy area. Recently Mr. Doty has been an outspoken critic of proposed sand mining areas near the Vineyard, as outlined in the state’s draft Ocean Management Plan. Those areas do not coincide with the Massachusetts wind energy area, and the plan is still under review. An environmental study by BOEM found no significant impacts associated with the engineering studies that will be required before any wind farms are built. Those studies will be carried out by the developers, along with construction plans and further environmental studies, in the years following the auction. Vineyard Power, a nonprofit, marked its five-year anniversary at the annual meeting held on the Vineyard in August. To date the cooperative has focused largely on four solar installation sites around the Island and on planning for the wind farm leasing venture. Membership in the cooperative has held steady at around 1,400 households and businesses, representing perhaps 6,000 individuals. The stated goal has been to reach 8,000 members. Mr. Andre hoped a successful partnership in the lease would mark a turning point and help spur additional interest. Membership is currently set at $200. An earlier version of this story reported incorrectly that Vineyard Power had met with Energy Management Inc. as a possible partner. Vineyard Power president Richard Andre said no discussions have been held with EMI and none are contemplated.